The cello has always been held in high esteem for its warm, noble timbre and range of expression. So it is no wonder that numerous solo pieces have been written for the instrument. 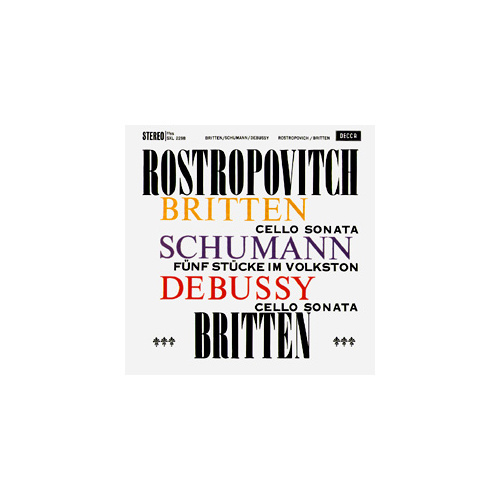 In this recording, the cellist Mstislav Rostropovich, together with the great Benjamin Britten at the piano, have left the accustomed pathway to perform three less well-known – but nevertheless excellent – works from the 19th and 20th century. Robert Schumann’s Fünf Stücke im Volkston allows the cellist to bring out the whole beauty of his instrument. Well-paced tempi, a crystal-clear tone, and an exquisitely precise piano part emphasize the unique character of this music – a work which points the way towards modern times. 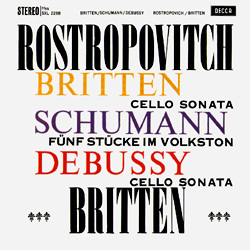 Britten’s Cello Sonata was tailormade for Rostropovich and dedicated to the great cellist. The two musicians, both of them technical perfectionists, provide an inspired performance – beginning with the thrilling dialogue of the very first bars, via a lyrical elegy, right up to the gripping Finale in 6/8 time. 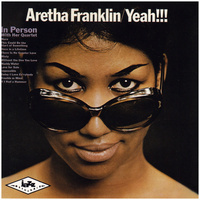 To sum it up: top marks for music, tonal quality and choice of repertoire.